Known as the famous Kayak which has traveled the whole length of the Amazon River two times, the Sevylor Tahiti inflatable boat is a classic kayak that is both affordable ( approx $140) and heavy duty (400 lbs. weight capacity i.e. two people). It was originally released in 1963 and the build hasn’t changed all that much since. This vessel is made out of tough 26 gauge polyvinyl-chloride and sports dual air chambers to provide additional security. 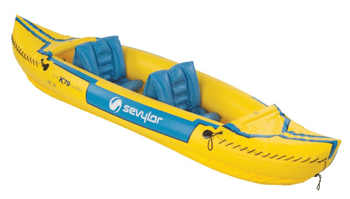 What is so good about Sevylor Kayaks? The I-beam construction of the floor enhances its stability. Because of the custom made inflatable seats with back supports, this craft is exceptionally comfortable. Holds up to 400 pounds; measures 10' 7" by 2' 7"
Just like any other Sevylor kayak, it also has the proprietary Airtight mechanism which guarantees that there won’t be a leak. An optional directional skeg can be installed for better tracking, and the boat also has a couple of spray covers to protect your gear. It also packs a repair kit so you can fix it on the go. Measuring in at 10’7’’ x 2’7’’ and being extremely lightweight, this NMMA certified vessel, can easily be handled by one person. Affordability: The extremely low price makes it a great choice for the casual kayaker who won’t do anything more than exploring a lazy lake. Beyond that point, you should consider something else. Body: Extremely rigid (namely due to the I-beam floor). Excellent hand pump, and you’ve also got the choice of several fittings. 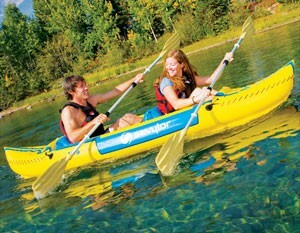 Durability: The PVC out of which this kayak is made can sustain rough handling and the elements. Safety: Dual air chambers ensure that even if there is a leak in one, the boat will stay afloat. Optional skeg (purchased separately) can improve its navigational prowess. Load carrying ability: It can easily carry two kayakers with its 400 lbs. load limit. Otherwise, a solo kayaker can use the extra capacity to carry their gear. Mobility: The extremely light weight of this vessel makes it possible for even a single person to handle it with total ease. The seating of this kayak is disappointing. In rivers, especially, if the boat ever happens to flip over, the seats, being inflatable, will float away from the kayak and you’ll have a very hard time finding them again. It is better to utilize snap-on seat backs from other vessels if you absolutely have to. Poor tracking if you don’t install the skeg since it wasn’t designed to be a speedy vessel. The lack of addons, such as paddles, skeg and pump, can be a turnoff for some. The valve system has been problematic for a number of users. This kayak can in no way be compared to standard sea touring kayaks. It is considerably slower and doesn’t track as well either. It’s very low cost is its only saving grace which can make it a reasonable purchase for someone who is starting out in kayaking or won’t take it out for anything more than some lazy lake exploration.